SERI Kembangan lies to the south of Kuala Lumpur city centre and about 15km from Cyberjaya. It is home to landmarks such as the Palace of the Golden Horses hotel, the Selangor Turf Club, The Mines Shopping Mall and Universiti Putra Malaysia. Formerly known as Serdang New Village, Seri Kembangan has evolved from a backwater to an urban town. Surrounding it are the townships of Sri Petaling, Bukit Jalil, Puchong, Bandar Kinrara, Cyberjaya and Putrajaya. And it is this proximity to these areas that has worked to Seri Kembangan’s favour, says real estate agency Propedia Consultancy founder and principal Vicky How. “In the early years, there weren’t many housing developments in Cyberjaya and Putrajaya, so housing developments in Seri Kembangan became preferred choices for people who worked in Cyberjaya – for its attractive rental, close distance, good accessibility and amenities,” she tells EdgeProp.my. Cyberjaya, which was once touted as the Silicon Valley of Malaysia in the late 1990s, has become a convergence of hundreds of IT-related companies. The resulting increase in business activities and working opportunities there has created a spill-over effect on Seri Kembangan. How adds that the opening of the Smart Tunnel, which links Seri Kembangan to Kuala Lumpur city centre through the KL-Seremban Expressway, has also spurred market interest in areas on the edge of Seri Kembangan such as Taman Serdang Raya and Serdang Jaya. “It [Seri Kembangan] is a considerably big town. It takes about 40 minutes’ drive from north to south. As such, house prices there vary depending on type and location. There are luxury bungalows selling at millions of ringgit as well as basic wooden houses in the new village,” she explains. Generally, residential property values in Seri Kembangan have been climbing over the years especially properties located close to major highways. Areas bordering Cyberjaya, business hubs and close to highly populated KL neighbourhoods such as Sri Petaling and Bukit Jalil are also preferred by homebuyers in Seri Kembangan, thus fetching higher prices. 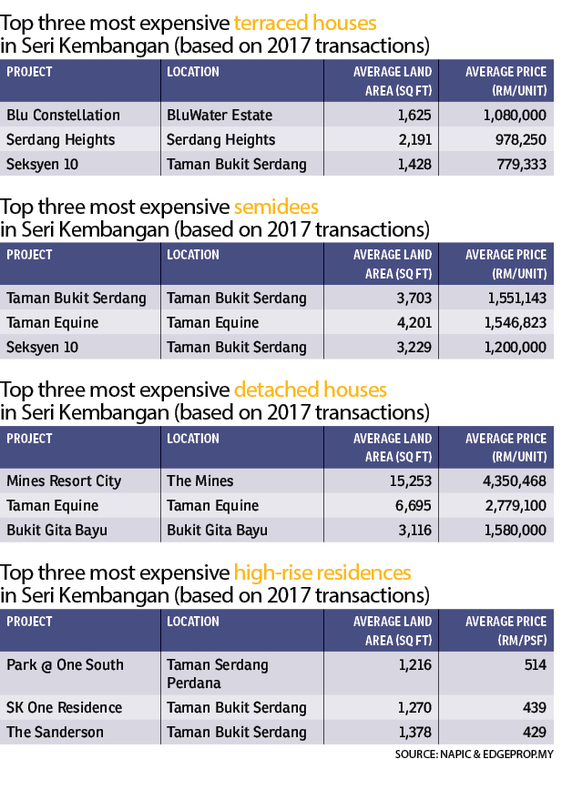 According to EdgeProp.my’s residential property transaction data in Seri Kembangan, a total of four bungalows in the Mines Resort City changed hands in 2017 at an average price of RM4.35 million each or RM335 psf based on land area. In the same year, a total of seven detached wooden houses in Kampung Baru Cina Seri Kembangan around 5km away from the Mines Resort City, were sold at an average price of RM425,000 or RM95 psf. ECS Valuation & Property Consultancy Sdn Bhd director Eu Chee Siang reckons that Seri Kembangan’s main draw for property buyers is its strategic location that offers easy accessibility to parts of the Klang Valley and Greater KL via major highways. Some may also be attracted to the higher education institutions there including Universiti Putra Malaysia. Residents in Seri Kembangan could reach Seremban, Negeri Sembilan via the Kajang-Seremban Expressway (Lekas) or North-South Highway, or get to Semenyih and Kajang through the Kajang Dispersal Link Expressway (SILK) in about 30 to 45 minutes (in normal traffic condition). A 15 to 20 minutes’ drive along the Maju Expressway (MEX) or Sungai Besi Expressway (SBE) could bring residents to the KL suburbs of Kuchai Lama, Bukit Jalil, Sri Petaling as well as Cyberjaya, Selangor and Putrajaya. Full Homes Realty Sdn Bhd senior negotiator Vivian Ong says Seri Kembangan is a popular choice for homebuyers looking for spacious yet affordable homes with many convenient amenities at hand. “Most of them buy for own-stay. Many of them have been staying in Seri Kembangan for some time and want to upgrade to bigger units. Not many buy solely for investment,” she adds. 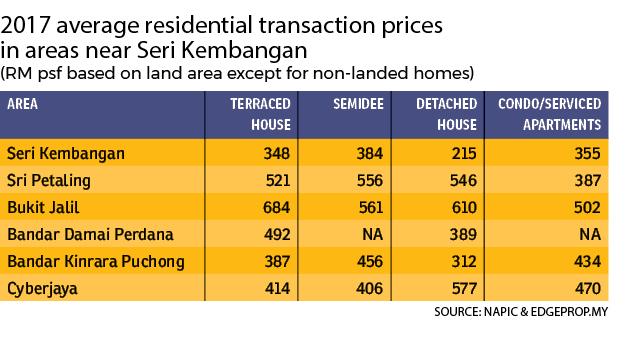 A look at Seri Kembangan’s past housing transaction data showed that average housing prices tend to be lower than those in neighbouring townships such as Sri Petaling, Bukit Jalil, Bukit Damai Perdana and Bandar Kinrara. According to data collated from the National Property Information Centre (Napic), the average selling price of terraced houses in Seri Kembangan in 2017 was around RM530,116 or RM348 psf based on land area, compared with similar houses in Sri Petaling (RM801,805 or RM521 psf) and Bandar Kinrara Puchong (RM612,944 or RM387 psf). 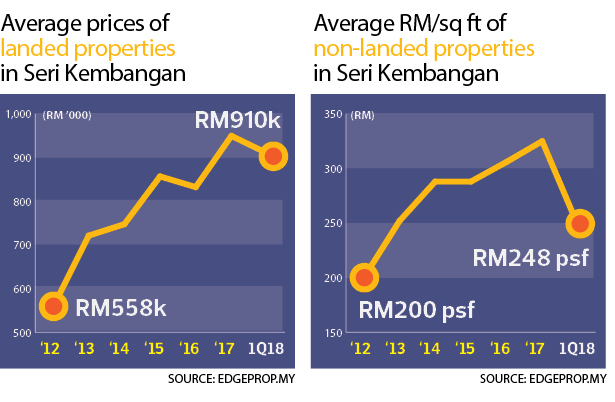 Meanwhile, transaction prices for semi-detached homes in Seri Kembangan averaged RM1.48 million or RM384 psf, while in Sri Petaling, they sold at RM2.39 million (or RM556 psf). As for bungalows, the average transaction price in Seri Kembangan last year was RM1.32 million per unit or RM215 psf, compared with RM4.33 million or RM546 psf in Sri Petaling. In the non-landed homes segment, the average transacted price of Seri Kembangan’s condos and serviced apartments in 2017 was around RM354,658 or RM355 psf which was lower than the average price of such homes in Sri Petaling and those in Bukit Jalil which transacted at an average RM492,595 or RM387 psf and RM658,737 or RM502 psf respectively. According to Propedia’s How, despite its easy access to KL and other business hubs, Seri Kembangan’s housing prices are generally lower than its KL neighbours because it carries a Selangor address. On the other hand, its relative affordability makes it attractive to homebuyers. Homebuyers looking for spacious properties can find a terraced house selling at around RM700,000 while 10 minutes’ drive away, a terraced house of similar built-up and land area size might cost above RM1 million. “Furthermore, residents or families who have been staying in Seri Kembangan for a long time will tend to stay on and purchase new homes in the same area. This supports property demand in the area,” she adds. Seri Kembangan’s popularity among homebuyers is evident from the number of residential property transactions there, which has outrun some of the neighbouring areas. For instance, EdgeProp.my’s data showed that a total of 1,340 terraced houses changed hands in Seri Kembangan from 2012 to 1Q18, compared with 660 transactions in Bandar Damai Perdana and 519 transactions in Sri Petaling. In terms of condominium and serviced apartments, a total of 3,282 properties were sold compared with 2,411 transactions in Bukit Jalil and 652 transactions in Sri Petaling. Eu from ECS concurs that the more affordable properties in Seri Kembangan compared with nearby areas including new townships in Semenyih, Kajang and Puchong South, have provided Seri Kembangan a relative advantage given its accessibility. “Buyers are generally focused on the Seri Kembangan/Serdang area for its strategic location, convenience and proximity to public transportation [the upcoming MRT Line 2]. It is also a mature township with plenty of amenities, such as banks, restaurants, schools, as well as universities and colleges,” he says. The mass rapid transit (MRT) Line 2 or the Sungai Buloh-Serdang-Putrajaya line runs from Sungai Buloh to Putrajaya with the Serdang Raya North, Serdang Raya South, Seri Kembangan, Universiti Putra Malaysia, Taman Universiti, Equine Park and Taman Putra Permai stations serving Seri Kembangan and Serdang folk. High-end homes in Seri Kembangan have also been selling well. For instance, between 2012 and 1Q18, 242 detached houses were transacted in Seri Kembangan compared with 73 bungalows in Bandar Kinrara, which is 14km away. Full Homes’ Ong also notes the presence of international schools in Seri Kembangan which have attracted higher-income families to settle down in the area. The international schools located in Seri Kembangan include Alice Smith School — Secondary Campus, Australian International School, Kingsgate International School and Universal International School. “Quite a number of parents who are looking for larger homes with bigger land area, good living environment and close to international schools, will choose to stay in Seri Kembangan,” she explains. As Seri Kembangan becomes more vibrant with commercial activities and various amenities such as shopping malls and tertiary education institutions, more homebuyers and investors are beginning to see the potential of this place. The housing rental market in the area is also strong. Some landed houses have expat tenants who work in Bukit Jalil, Cyberjaya and Putrajaya. Ong says the monthly rent for a 3-storey bungalow is around RM6,000, while a 3-storey semidee could fetch a monthly rent of around RM5,000. Based on EdgeProp.my’s current rental listings, the average asking rent for detached houses in Seri Kembangan range from RM4,767 to RM16,667 (or RM1.38 to RM2.62 psf based on land area). Eu from ECS adds that the rental market in Seri Kembangan is quite stable especially in areas close to universities and colleges where the market is supported by students and university staff. 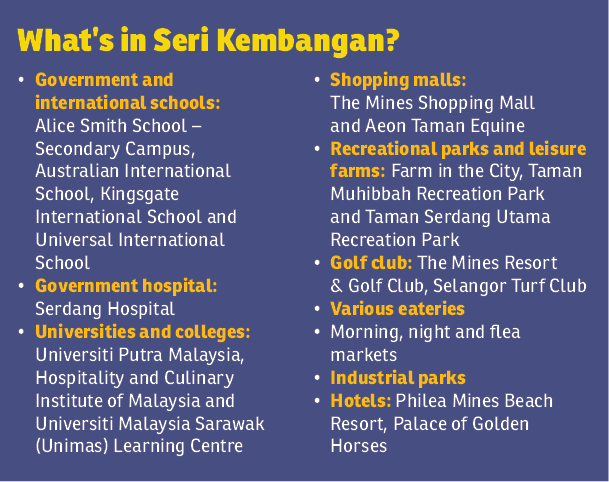 The tertiary institutions located in Seri Kembangan include Universiti Putra Malaysia, Hospitality and Culinary Institute of Malaysia, Universiti Sultan Zainal Abidin South City branch, Universiti Malaysia Sarawak KL Learning Centre and Portman College. EdgeProp.my listings show that the asking monthly rent for condominiums in Seri Kembangan range between RM1 and RM3.06 psf (or between RM850 and RM1,495). The experts opine that its advantages and future potential with the completion of the MRT Line 2 will continue to attract people to work and stay here. How from Propedia says Seri Kembangan is seeing more new projects while property prices continue to climb, supported by strong demand. “You can basically get everything here, from daily needs, education, shopping and leisure as well as business activities — it is a self-sustaining community,” she adds. Meanwhile, Eu from ECS says Seri Kembangan’s growth potential has been boosted by its improved road and public transport infrastructure and connectivity. He stresses that prices increased by about 20% to 30% from 2013 to 2017, noting that in 2013/2014, there were many new launches in Seri Kembangan and those properties were completed in 2016/2017. “Increased supply in Seri Kembangan has put some pressure on sales, so we think prices will remain stagnant for now. However, it will slowly pick up throughout this year supported by its good location, great infrastructure, educational establishments and various amenities,” he concludes.